"Considerable time, resources and money now lost on unorganized, trial-and-error approaches to storage dump debugging ..."
Daniel H. Rindfleisch, Author of "Debugging System 360/370 Programs Using OS And VS Storage Dumps"
Huge amount of "time, resources and money now lost on unorganized, trial-and-error approaches to [memory] dump debugging". Read more about Join Debugging Diagnostics Revolution! Learn how to analyze application crashes and freezes, navigate through process memory dump space and diagnose corruption, memory leaks, CPU spikes, blocked threads, deadlocks, wait chains and much more. We use a unique and innovative pattern-oriented analysis approach to speed up the learning curve. The training pack consists of practical step-by-step exercises using GDB and LLDB debuggers highlighting dozens of memory analysis patterns diagnosed in 64-bit process memory dumps from Mac OS X and Linux platforms. Complete Pattern-Oriented Software Diagnostics Training Pack features 10 training courses, 160 hands-on exercises, 2,500 pages of training books, and free named Software Diagnostics Library membership with access to the vast collection of patterns and case studies. 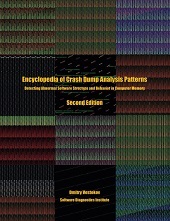 Problem: You are not satisfied with a crash analysis report. Problem: You are a novice and need expert pattern-oriented analysis of your crash and hang memory dump files or debugger logs. Problem: Your critical issue is escalated to the VP level. Engineers analyze memory dumps and software traces. No definite conclusion so far. You want to be sure that nothing has been omitted from the analysis. The full transcript of Software Diagnostics Services training course with 12 step-by-step exercises, notes, and selected questions and answers. Learn how to navigate through memory dump space and Windows data structures to diagnose, troubleshoot and debug complex software incidents. The training uses a unique and innovative pattern-oriented analysis approach to speed up the learning curve. It consists of practical step-by-step exercises using WinDbg to diagnose structural and behavioral patterns in 64-bit kernel and complete (physical) memory dumps.